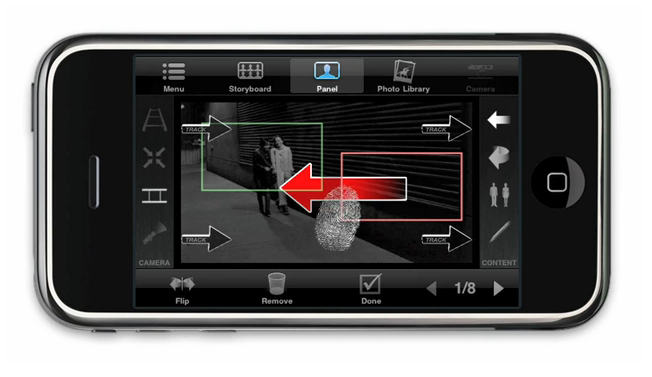 Hitchcock – mobile storyboarding for your iPhone has been released on the App Store and it may well be the best $20 you’ll spend for your next creative production! Just imagine being able to take a snapshot of a character, location, scene, etc, and then being able to instantly add a dolly, pan or zoom to it. Need a stand-in for your talent? Pop in male or female figures and scale, rotate and position them. Want a sound recording or audio note? Add one! Set shot and scene numbers and duration. Reposition panels at your leisure. And then send out a PDF of the storyboards to your cast and crew! All from your pocket-sized workstation that was your iPhone. Hitchcock is a brilliant bit of creative software that is highly recommended.